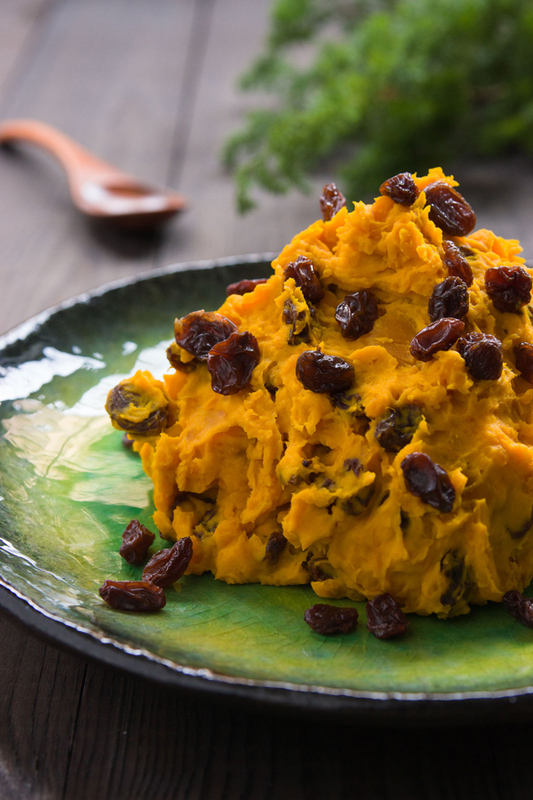 This Kabocha pumpkin and cream cheese salad is a delicious side dish for a holiday meal. Although it only has four ingredients and comes together in about ten minutes, its stunning hue and make-ahead nature, make it perfect for any potlucks you have coming up. 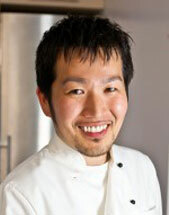 Kabocha is the Japanese word for pumpkin, but it also refers to an Asian variety of green-skinned squash. It’s a great pumpkin for eating because it has a rich creamy texture that’s closer to sweet potatoes than the usual variety of orange-skinned pumpkins. In the U.S., it can be found year-round in Asian grocery stores and sometimes shows up in autumn and winter at farmer’s markets and upscale supermarkets. While you can steam the pumpkin on the stove, it’s easier to steam it in the microwave by adding a bit of water and covering it with a lid or plastic wrap. After it’s tender, you just need to mash it up a bit and incorporate the cream cheese. This gives the salad a creamy texture and flavor that makes it taste like ridiculously buttery mashed potatoes. Studded with sweet raisins, this simple salad is a treat for the eyes as well as the palette, pairing beautifully with savory meats like roast chicken, a rack of lamb, or a braised ham. If you do end up making this for a party, be sure to make a bunch, as it’s always a hit with kids (the small kind and the fully grown kind). You should also be prepared to get asked for the recipe. 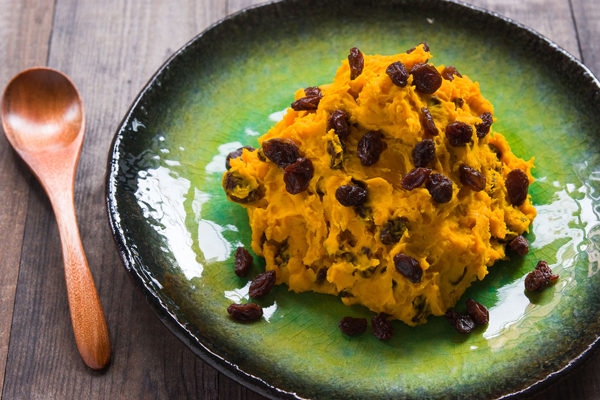 This easy, 4-ingredient recipe is perfect for winter and fall potlucks. 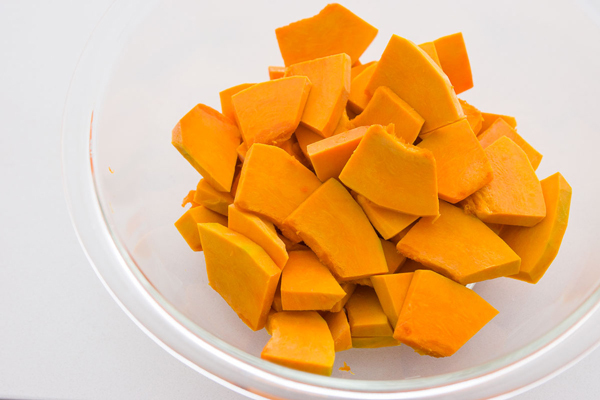 Put the sliced Kabocha in a microwave-safe bowl, and then add about a tablespoon of water. Cover and microwave at 600 watts for 6 minutes (or until the Kabocha is soft). 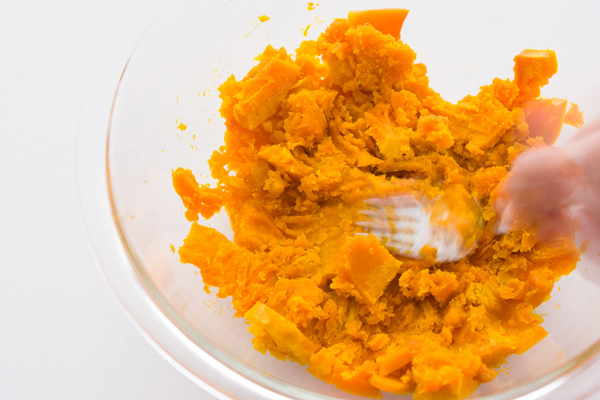 Roughly mash the cooked Kabocha using a fork, and then stir in the cream cheese and salt. Add the raisins and mix together to combine. You can save some of the raisins for sprinkling on top when you serve it.